The American Beverage Association spends substantial time and money trying to convince people there’s no relationship between soda and disease. It’s not working very well. One glimpse at the ABA’s Facebook page will show you how few are interested in ABA propaganda. And soda regulation is now one of the hottest topics of debate across the country, not to mention Mexico and the UK. The simple concept of cause and effect says that if soda causes obesity, then obesity rates should decline as soda consumption declines. But just the opposite has happened. Obesity has gone up as soda consumption has gone down. Unfortunately the ABA’s defense of soda doesn’t withstand scrutiny. First, the ABA misrepresents the case against soda. Scientists and public health activists such as Robert Lustig and Marion Nestle have not claimed that soda is the ONLY cause of obesity. In fact, soda is a source of added sugar and calories that contributes to obesity. So if you want to eat a healthier diet, it’s a good idea to start by cutting out soda and other sources of added sugar. … if reduced energy intake is desirable, all caloric foods are candidates. A reduction in consumption of added sugars should head the list because they provide no essential nutrients. And the case against soda goes beyond obesity. Studies have shown that added sugar and sugar-sweetened beverages contribute to diabetes and heart disease, even if you control for weight gain or calories (1,2,3,4). No, you can’t jog away Coca-Cola’s toxicity. Does ABA’s Argument Work for Cigarettes? So less smoking means less lung cancer, right? No – it’s not that simple. Male lung cancer has indeed decreased. On the other hand, the female lung cancer death rate increased dramatically from 1965 to 2000, as did female lung cancer diagnoses. 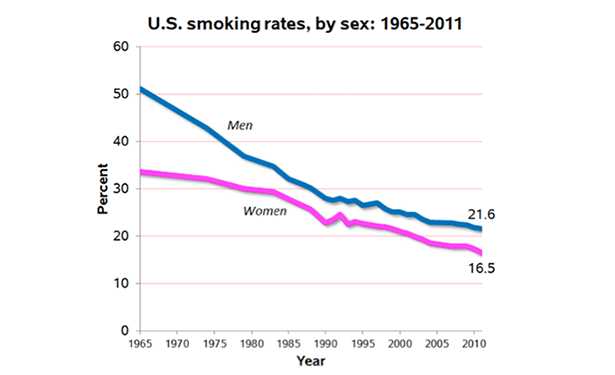 For decades smoking went down, while female lung cancer went up. If we applied the ABA’s defense to cigarettes, we’d conclude that smoking doesn’t cause female lung cancer. Shall we add a packet of Marlboros to our Pepsi-Cola party? Not so fast. Cigarettes aren’t the only cause of lung cancer. Asbestos, radon and uranium also significantly increase the risk of lung cancer. So if female smoking decreased while female exposure to those chemicals increased, that is one possible explanation for the graphs above. Nor can we discount soda’s contribution to obesity using the ABA’s logic. Health-conscious readers should disregard the ABA’s arguments and strenuously avoid both soda and cigarettes. Not even Cochran could acquit soda of contributing to diabetes, obesity and tooth decay. I agree, but in my mind the two statements made by the ABA which are highlighted in the article do in fact make a clear and compelling argument that soda is not as big a factor in the development of obesity as some would like to think. Have you reached the same conclusion about cigarettes and lung cancer, in females? I have not simply because I prefer to deal with one topic at a time. I would imagine that comparing apples to oranges provides little compelling evidence for any argument. However, the information provided seems to lead to the same general conclusion – that there is more than one variable contributing to the two diseases. You are correct that there are multiple variables that contribute to obesity and lung cancer. Comparing soda to cigarettes is not “apples to oranges.” The same statistical trend occurred in both cases: consumption of a substance decreased, disease incidence increased. In other words, if you would conclude from this pattern that soda doesn’t cause obesity, then you must also conclude from it that cigarettes don’t cause female lung cancer. Otherwise, on what basis would you follow the ABA logic for soda but not apply the same argument to the same circumstances for cigarettes? Simply because obesity and lung cancer are two different disease processes with completely different causes, risk factors, incidence rates, etc. The research for each would probably be very different and therefore, in my opinion, difficult to compare on such a superficial level. If you’re going to insist that the ABA argument works for soda, but not cigarettes, withouts specifying why the argument doesn’t apply to cigarettes, then there’s nothing I can say to dissuade you. Have a good one. I’m sorry if my explanation doesn’t satisfy you. To most any scientific researcher, the reasons stipulated above more than merit the exclusive nature of the two diseases and their causes. That said, I think we have determined that neither soda nor cigarettes are the singular causes of obesity or lung cancer respectively which was my initial comment in any case. Take care. 90% of lung cancer cases are caused by active smoking; 10% by exposure to radon. I agree that soda is a huge part of the obesity problem, but are there studies that are able to quantify the tie obesity to soda consumption? Excellent. Thank you for the link, sir.